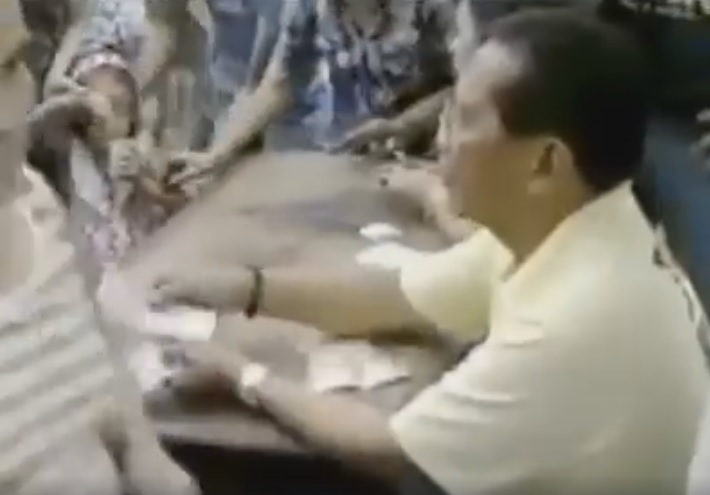 A video of VP Binay handing out paper money bills to residents in an undisclosed location is doing the rounds online. The video was uploaded 10 hours ago and viewed more than 131,000 times and counting. It is not known whether the video was captured during the campaign period or not. Otherwise, VP Binay could be held liable for violating the Omnibus Election Code. According to Section 261 (a)(1) of the Omnibus Election Code of the Philippines, any person who gives, offers or promises money or anything of value, gives or promises any office or employment, franchise or grant, public or private, or makes or offers to make an expenditure, directly or indirectly, or cause an expenditure to be made to any person, association, corporation, entity, or community in order to induce anyone or the public in general to vote for or against any candidate or withhold his vote in the election, or to vote for or against any aspirant for the nomination or choice of a candidate in a convention or similar selection process of a political party. The video elicited mixed reactions from the netizens. One group condemned the act while others asked netizens to exercise proper discernment before judging the candidate. One netizen commented that the video was old because based on his observation, VP Binay looked younger on the video. Another netizen claimed the video was taken during Christmas and it is customary for politicians like VP Binay to distribute money o Christmas day to his constituents.